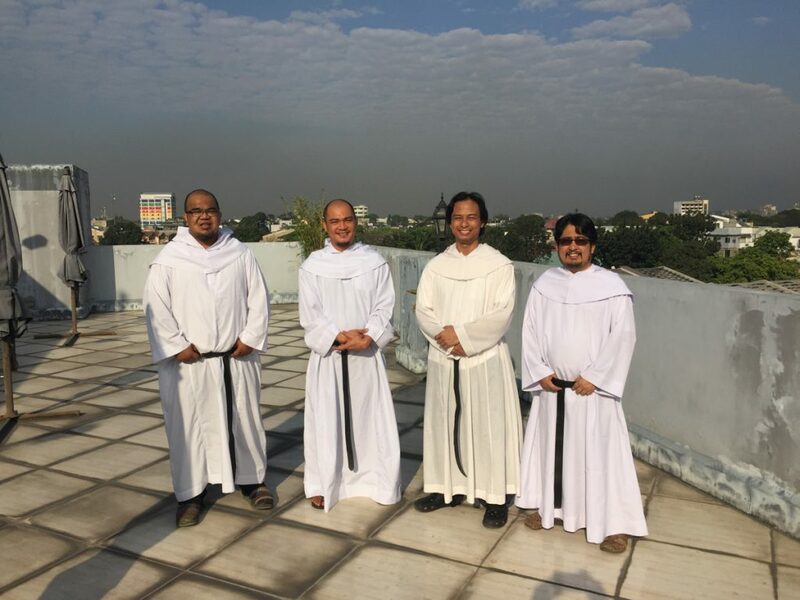 Provincial Curia, QUEZON CITY – In a rare opportunity, like the appearance of a Halley’s comet, some Filipino Recoletos friars assigned in foreign mission stations and who were either arriving for or returning from their hometown vacation have crossed their paths at the Provincial Curia towards the end of the second week of March. Fray Russell Lapidez and Fray Dominador Mercado, Jr. who arrived from Indonesia on March 12 met Fray Giovanni Gil Magbojos and Fray Jose Prudencio Castillo who then were preparing for their return to Taiwan and Sierra Leone, respectively. For these young missionaries, sharing of the way they live their religious life and roll out the program of evangelization in the culture they are inserted just came about spontaneously. The Recoletos go where the Church needs and sends them. With such a charism that is responsive to any kind of human terrain and situation, they will remain always relevant, to which all the four missionaries concurred. Bringing out the issue on the dearth of native vocations in Taiwan, Fray Magbojos said that the Chinese Regional Bishops’ Conference (informally known as Bishops’ Conference of Taiwan) is cognizant of its reliance on the pastoral assistance of foreign missionaries. “That’s where our relevance lies,” he pointed out. He also said that if getting native vocations is the yardstick for the Recollects’ relevance in Taiwan, as this had been the view of some, then we cannot catch up with that because even the dioceses there find it difficult to look for candidates. Although there are Spiritans (Holy Ghost missionaries) who are working on the other side of the boundary, still a vast area where some Catholics are scattered and which will belong to the future pastoral jurisdiction of the Recollects is in need of shepherds and evangelizers. The Indonesian missionaries who have spent six months in Pontianak to learn Bahasa said they are now assigned by Bishop Agus to the parishes. In this way, they got to polish the new language they are learning and continued to gain mastery of the new culture. The presence of the Recollects in the archdiocese, they said, is a big boost to the personnel needed to serve the very wide coverage of Pontianak. Although the third member of the future community of “Recoletos de Bengkayang” (or whatever name will be more convenient) has already been identified, the appointed time to establish it might still be moved to next year to give ample time for the renovation of the church edifice and the construction of the convent. 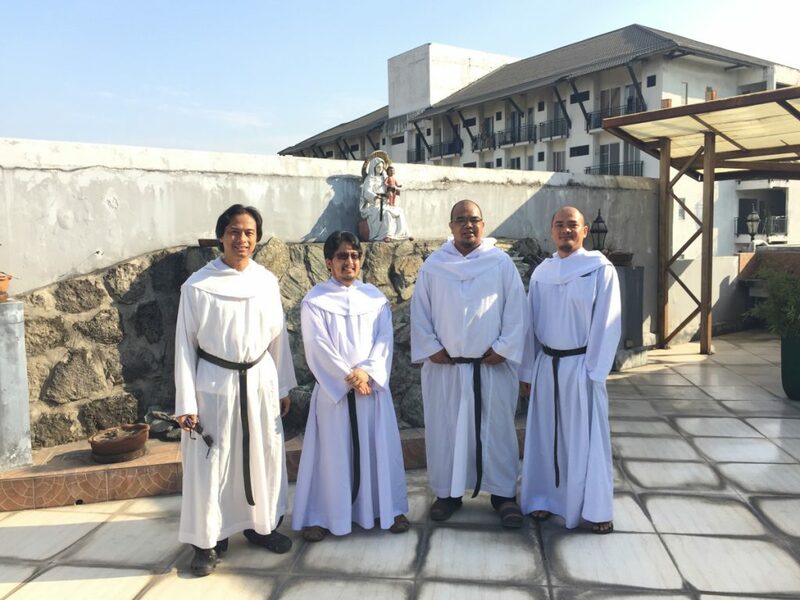 While they talked about the relevance of the Recollect missionary presence in the local church they are currently assigned, they also highlighted the presence and contributions of some compatriots who comprise a sector of social concerns unique to the Province of St. Ezekiel. “Sila mismo ang lumalapit sa amin” (“They themselves are the ones approaching us”), observed Fray Magbojos, referring to those Filipino workers who would go to mass in their parishes in Taiwan. In the Diocese of Kaohsiung, at the south of this Chinese-speaking state, five Filipino Recollect missionaries are administering five parishes and a chapel: St. Nicholas of Tolentine Parish and Holy Cross Parish in Daliao; St. Joseph Parish and Our Lady of Victory Parish in Xiaogang; St. Augustine Parish in Linyuan; and the St. Ezekiel Moreno chapel in Fanua. According to Fray Magbojos, Filipino mass-goers are aplenty in all but in Our Lady of Victory Parish. Some of these OFWs (Overseas Filipino Workers) are employed in electronics or meat processing companies; others are domestic helpers. Although the Scalabrinian missionaries are mainly involved in this kind of apostolate with the OFWs, we cannot remain indifferent to it nor be selective in our “social concerns,” said Fray Magbojos who was responding to the question that working with OFWs is not part of the Recoletos’ missionary landscape. “When confronted with employment problems and these OFWs approach us, we cannot turn a deaf ear. We help them. We facilitate and bring their concerns to the Scalabrinians,” he noted. A similar situation was confirmed in the Diocese of Makeni in Sierra Leone, West Africa where nine Filipino Recollects are presently assigned. Five friars compose the community of Our Lady of Sierra Leone Parish in Kamabai and four, of St. Paul Parish in Kamalo. “Those OFWs who work as volunteers for the UN (United Nations) and other NGOs in Sierra Leone, or in big companies such as Toyota, Heineken, etc. are very supportive of our ministry,” shared Fray Castillo. Since there is no Philippine Embassy or Consulate in Sierra Leone, these “paisanos” have considered the Recollect communities in Sierra Leone as “centers” of their weekend gathering during which they participate in the Sunday liturgy. And they also extend their assistance to the pastoral programs. “Yes, even non Catholics come to us and join the group,” Fray Castillo averred. When, in turn, asked whether they had already met some OFWs in Pontianak City in Indonesia, Fray Russel said that they hadn’t. “Except for Filipino missionaries working in the archdiocese, I have not met any Filipino worker there yet.” Probably, that part of the world is not a green pasture particularly for income-seeking Filipinos.